The image for Day 329 pf the VM_365 project is a view from the east end of the south chapel of the Parish Church of St Nicholas at St Nicholas at Wade. The church itself featured in Day 321 of the VM_365 project. It is often easy to overlook the standing historic monuments when think about the archaeological sites in the environment around us and our Parish churches have many archaeological stories to tell. The south chapel at St. Nicholas was added to the building when the church was enlarged with the construction of the new east end in the late 12th or early 13th century. 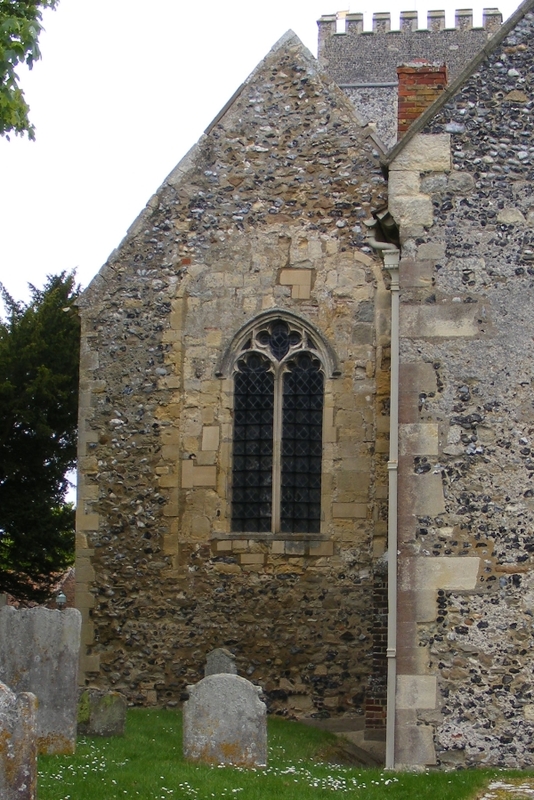 New windows were inserted into the building by the late 13th or early 14th century. In today’s picture one of the inserted windows in the east end of the south chapel can clearly be seen, the frame set within the old 12th/13th century window frame which has been filled with irregular blocks of stone. While the complex history of the medieval church can be read from the major changes made to the structure, it is important to remember that the Parish churches continue to evolve architecturally. New architectural elements have been added in more recent times and have made their mark on the building. In the 18th century the south chapel was used as a parish school and a fire was installed to warm the building for the children and teachers. A brick chimney stack inserted to draw the smoke from the fire can be seen in the picture, poking out from the roofline on the right hand side of the chapel. The structural evolution of the parish churches of Thanet can tell us a great deal about the social history of the population.The reconstruction and expansion of the churches demonstrates changes in the size of the local population. In some cases such as at Monkton and All Saints, Shuart showing a substantial decline in population. The varied uses the churches were put to, in addition to the routine of services and worship show how central a parish church was to a local community in the past. The architectural story of the Parish church buildings has much to offer anyone interested in the archaeology of Thanet.